Prosper stands out from its competition through their diverse loan choices. They provide investors with a broader credit spectrum to invest in (boasting access to E and HR grade loans) along with more credit variables for API and onsite filtering. This means you can choose to go for higher risk higher return loans by lending to people with less than stellar credit ratings and getting a higher interest rate to compensate for the increased risk, but there's still plenty of loans to be made to high credit borrowers - in fact, the average Prosper borrower's credit score is 700. This is a screen capture showing my returns from my peer to peer (P2P) lending account over at Prosper. I've been a P2P/Prosper lender since 2007. I was introduced to P2P lending about a decade ago by a friend who works in financial technology. I was intrigued, so I signed up for an account. I'm happy to report that I'm still investing money with Prosper today, almost a decade later. If you’ve never heard of P2P lending or the Prosper platform, you’re not alone. Despite issuing billions in loans, Prosper isn’t yet a household name. The P2P lending industry is growing at a brisk pace, so it won't be long before the average Joe is going to Prosper for a loan instead of the stodgy brick and mortar bank on the city corner. The best way to describe peer lending is with an example. Allow me to introduce you to Borrower Bob and Lender Lisa. Bob wasn’t always smart with his credit card usage. He managed to charge up $20,000. Now, he’s having a hard time paying down the debt which has a 20%+ interest rate. Bob learns that he can get a loan from Prosper for as low as 5.99%, depending on his credit and loan terms. Bob will have 3 years to pay it off, but he could have also chosen a term of 5 years. Bob applies for a Prosper loan and qualifies at an interest rate of 6.44%. A week later, Prosper deposits $20,000 into his bank account. He pays off the credit cards and looks forward to becoming debt free in 3 years. Where did the $20,000 come from? That's where Lender Lisa comes in. Lisa has some extra cash, but isn’t thrilled about the prospect of putting it in the bank where it won’t even keep up with inflation. She opens an account on Prosper where she can lend money to folks and earn a much better rate. Lisa reads that Bob is requesting a loan of $20,000 to pay down credit card debt. She views detailed information about Bob including his credit score, profession, income and state of residence. She decides to help him out by contributing $25 to his note (a loan is called a "note" in P2P parlance). Other lenders also decide to help Bob. When the note has secured $20,000 in funds and after Prosper has completed its review of Bob's information, the money is released to him. Prosper is a platform that connects borrowers and lenders in a fast, efficient manner. No bank required. 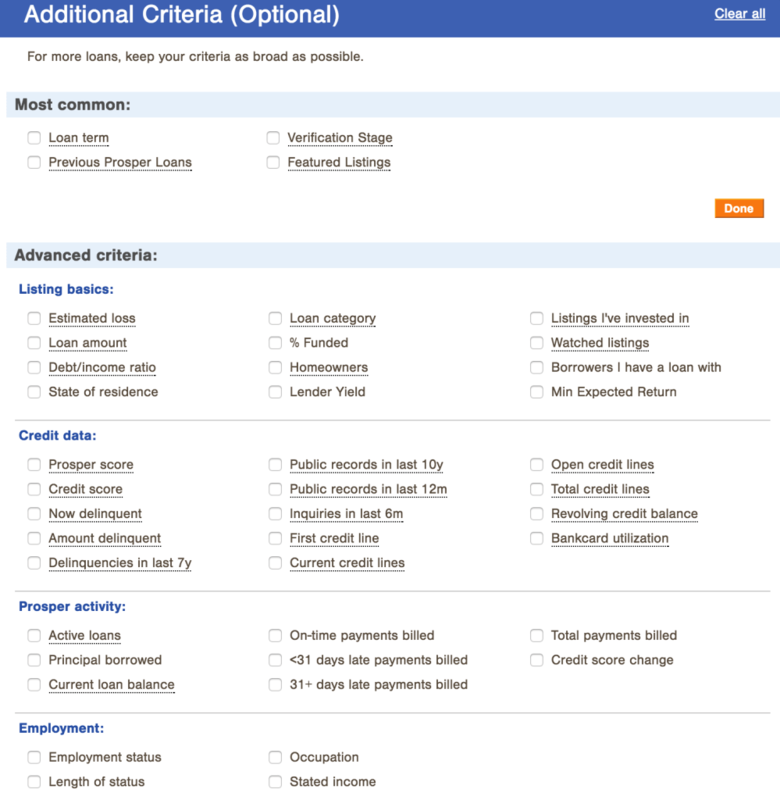 Just some of the loan criteria you may choose to filter with. Now, sit back and watch the interest roll in. Couldn't be simpler, right? Now that you understand the basics, let's review some best practices. Prosper can be a great addition to a balanced portfolio, but there are some important points to keep in mind. When I first started investing in Prosper, my strategy was to avoid defaults at all cost. 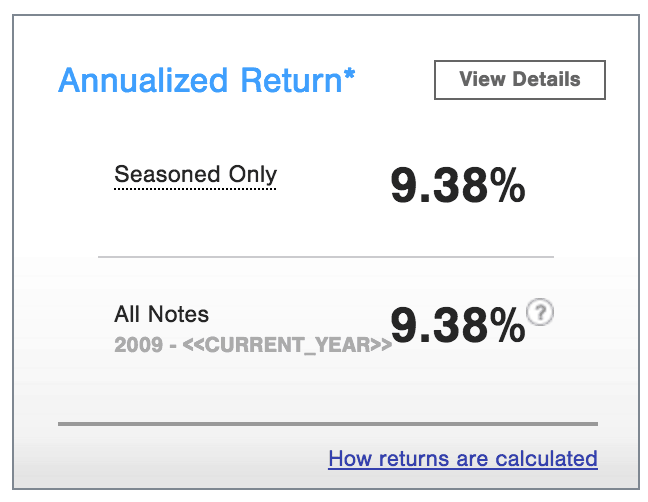 As a result, I only invested in higher grade A and B notes. I still remember how angry I was when my first note defaulted. Looking back, my safe strategy was misguided. Once you start studying P2P lending, you'll find that the riskier notes generally have a higher rate of return. The strategy of the savviest and most successful investors usually revolves around investing in lower grade notes. P2P lending is a vast topic, but the good news is that there is no shortage of great information. Similar to any investment, I encourage you to educate yourself. A great place to start is over at the Investors Section of Lend Academy. When I first started with Prosper, I thought it was great fun to manually pick my notes. As time went on, this exercise became time consuming and laborious. I highly suggest that once you become familiar with Prosper, you use the Automated Quick Invest feature or a 3rd party tool like nsrinvest to do the work for you. The 3rd party investment tools offer sophisticated features that aren't available on Prosper's own platform, but they're not free. Is Prosper a Good Investment? I encourage you to do your research to determine if P2P lending with Prosper fits your investment goals. In my own portfolio, I put money into Prosper that otherwise would have lost money to inflation in a bank account. As I get closer to retirement, I look forward to investing more money in Prosper to generate cash flow. You can try Prosper out for yourself by signing up for an account here. Like any investment, Prosper is not without risk. However, the service is almost a decade old, is regulated by the U.S. Securities and Exchange Commission and its model is being emulated by the big boys like Goldman Sachs. P2P lending has a bright future and I'm thrilled to be a part of it. When investors consider Prosper as an investment they need to remember that there have really been two iterations of the company. Prosper 1.0 was from their beginning in 2006 to 2008 when underwriting standards were very lax (the minimum credit score was 520) and investor returns, on average, were negative. Prosper 2.0 is from 2009 to the present day when underwriting standards improved dramatically (minimum FICO score is now 640) and returns for investors have been much better. Even though Lending Club attracts double the amount of loan applications, Prosper is still a formable alternative. It appears even with the new underwriting process, Prosper loans are slightly risker than Lending Club. This doesn’t mean Prosper is a bad investment. It means you must be more selective in the loans you choose. I suspect their credit review process is slightly different; I also see possible investment strategies in which Prosper could yield better returns. There are three guiding principles to my P2P lending philosophy. The first is that I don’t lend to people who have a history of more than two delinquent payments. I understand everybody runs into hardships and needs money sometimes. But if you’ve got three delinquencies, you’re out. There’s clearly something wrong with your financial situation or your ability to honor a contract. 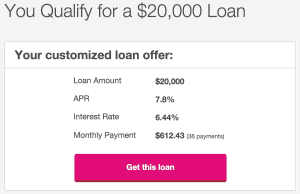 The second lending philosophy is to not lend money to people who want to buy stupid stuff they don’t need. You know, like a sail boat or a $50,000 wedding. Finally, I’m primarily only lending money to people who are using Prosper to consolidate their loans. Is Prosper legit? In one word - YES! Prosper has been around for ten years now. In the world of the Internet that is an eternity. As we cover the reviews of Prosper for borrowers and lenders you will see that this is a well maintained and viable way to invest and borrow money. Prosper is subject to state and federal regulations, just like any loan producing organization is. To put an even more legitimate light on the company, all loans that are originated through Prosper.com are made by WebBank. This is an industrial bank that is chartered in Utah and a member of the FDIC. There is a liquid secondary market for Prosper loans. That’s pretty nifty. You can sell your loan on Folio Investing any time you like. Keep in mind that depending on market conditions you may get more or less than you originally invested. Folio also charges 1% of the face amount of the loan as a transaction fee. Is Prosper a strong investment that you really should be thinking about? Well, that’s not my call, that’s up to you and your securities advisor. It’s not because Prosper is a bad idea, as a matter of fact, that couldn’t be further from the truth! Prosper is a great company but, because every portfolio is unique, without knowing you personally I wouldn’t be justified in giving you advise with regard to investments like this.